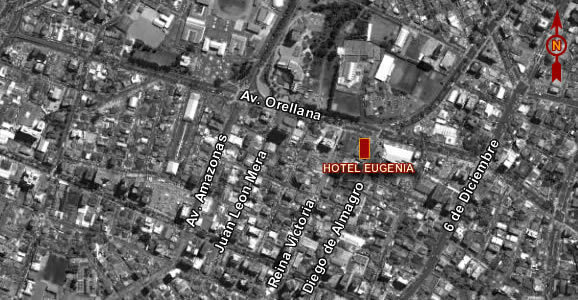 The Eugenia Hotel is located in the heart of the city within walking distance of major cultural and historic attractions of Quito. It's the perfect combination of comfort, luxury and convenience. Thanks to its location is easily accessible, making it ideal for those who travel for pleasure or business, in the surrounding area a lot of shops, restaurants, bars and nightclubs. The Eugenia Hotel has 34 rooms designed to maintain a distinguished appearance and stylish without compromising comfort. Guests can choose between a room with a double bed or twin beds, all equipped with bathroom, cable TV and telephone with international direct cisco.